It’s undeniable that the competitive landscape around Silicon Valley and its key players is a steep one, and that ‘magic’ that Apple infuses its products with doesn’t come without some ugly, behind-the-scenes elbow throwing. The corporate culture created by the competition between these companies is not for the faint of heart by any means. Earlier this week, we saw BlackBerry sue its own Senior Vice President of Software, Sebastien Marineau-Mes, as he attempted to jump off a sinking ship and take a VP job at Apple. In that case, the court offered that BlackBerry can enforce the contract which dictated its employee give six months notice before defecting to the other side, which it did. And BlackBerry isn’t alone in extending a cold hand void of much empathy. The devil is in the details of the emails exchanged by the leaders of Apple and Google. See for yourself what predicated Jobs’ call for a thermonuclear war against Google. 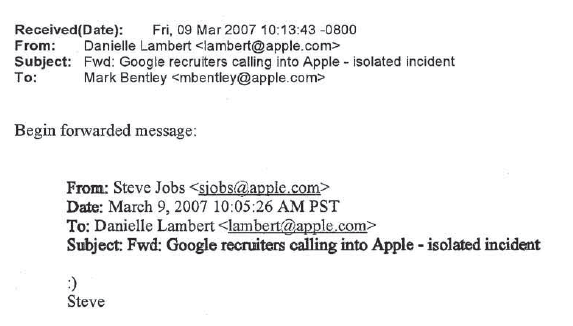 When Jobs found out that a Google recruiter was actively trying to poach and Apple employee, he followed up with a friendly email to Google’s Eric Schmidt. “I would be very pleased if your recruiting department would stop doing this,” Jobs said. After a few exchanges later, Schmidt let Jobs know that the incident was an isolated one and was corrected by the recruiter being dismissed. And how did Jobs react? He forwarded Schmidt’s note that the Google employee had been fired to Apple’s HR lead… with a smiley face. Brutal.